It is unclear why the 1994 Catechism of the Catholic Church omitted the traditional precept on marriage. Following the ecumenical focus of the Second Vatican Council and Pope Paul VI’s 1970 motu proprio on mixed marriages, it appears that the Church may have simply acquiesced to the increasing indifference among many Catholics who did not see their faith as a priority when choosing a spouse. Considering the confusion among the faithful regarding marriage in recent decades, it would seem that now is the time to highlight, rather than delete, this precept from the catechetical life of the Church. Listening to a Catholic radio show recently, I heard the tragic stories of one caller after another expressing how their own mixed marriages (or those of their parents) had resulted in entire families falling away from the Church. This disparity of cult, marrying a non-Catholic, was always discouraged by the pre-conciliar Church, as demonstrated by the sixth precept. It should be obvious to us all that mixed marriages have presented a serious obstacle to raising children in the faith over the last four decades. “Because of these challenges, the church requires the Catholic party (in the marriage) to be faithful to his or her faith and to “promise to do all in his or her power” to have their children baptized and raised in the Catholic faith. This provision of the 1983 Code of Canon Law – with its wording to try one’s best – is a change from the 1917 version, which required an absolute promise to have the children raised Catholic. “Likewise, the non-Catholic spouse is no longer required to promise to raise the children in the Catholic faith, but “to be informed at an appropriate time of these promises which the Catholic party has to make, so that it is clear that the other party is truly aware of the promise and obligation of the Catholic party,” the code states. Thankfully, many Catholics are rediscovering traditional resources such as The Catechism Explained and The Baltimore Catechism. For those parents and parishes who utilize these earlier catechisms for forming the next generation, the importance of a Catholic marriage will be prominently stated within the precepts. Both clergy and the laity need to reclaim a bit of common sense in the coming years as well. It is unrealistic to expect mixed marriages to produce an environment conducive to effectively raising children in the faith. Something as important as our faith, a matter of (supernatural) life or death, deserves to be nurtured by both parents in a truly Catholic household. This doesn’t mean that disparity of cult can always be avoided. However, it can be discussed, discouraged, and explained why unity of faith is vitally important. To this point, it is interesting to note that 80 percent of the men ordained to the priesthood the last two years came from households where both parents were Catholic (according to the Survey of Ordinands to the Priesthood by CARA). We have seen the near total collapse of the faith in family after family over the last two generations. We have simultaneously witnessed the attack against marriage itself, beginning with an attempt to redefine the very nature and purpose of the male-female relationship. It is a tragic irony that the very disappearance of the sixth precept of the Catholic Church from the Catechism has coincided with the widespread disappearance of sacramental marriage among so many professing Catholics. Possibly it’s time to once again ensure that all lists of the Precepts of the Catholic Church include the sixth on observing the Church’s teaching on marriage. Posted on October 18, 2015, in holiness, life and tagged Baltimore Catechism, catechism, marriage, precepts of Catholic church, sixth precept. Bookmark the permalink. 32 Comments. My father was a product of a mixed marriage. He and his siblings all lost their faith. I am a product of a mixed marriage. I have found my way back. My husband’s father was a product of a mixed marriage—but his father converted eventually. My husband is also a product of a mixed marriage—out of 6 children, my husband is the only Catholic. Thank you for your comment Cindy. Your families situation is exactly the reason why this post, and the subject addressed by it, is so very important. Pax. I disagree with you. Please read my response below. You should retract this article or at least change the headline. There is a great deal that you do not understand about what a precept is know what the sacrament of matrimony. I was raised in a Catholic family, where both parents were practicing Catholics. Unfortunately, all 3 of my siblings married non-Catholics, and none of them or any of their children are Catholic, 30 years later. I was the only one who married a Catholic. We are both active Catholics, very involved in our faith. One of our children left the faith during college, but our daughter is currently a 2nd year novice with the Sisters of St. Francis of Perpetual Adoration, and our teenage son loves the Catholic faith and is open to God’s call for his vocation, whether that be the priesthood, religious life, or marriage. Thank you for sharing your story Mary. It is unfortunate that your siblings no longer practice their faith, but a blessing to hear that there may be a vocation to the priesthood or religious life for one of your children. Yours is yet another example of why Holy Mother Church always stressed the importance of marrying within the faith, and why it was considered to be a precept of the Church in years past. I grew up in an almost totally Catholic environment. Exception:the kid who managed our Catholic youth group BB team was Lutheran. My parents conveyed the idea that mixed marriages were an abomination, and so I grew up feeling the same way. Still do because of what I’ve seen as a result of mixing religions. Maybe “bringing up the children Catholic” has worked for some people, but I never have seen it so. The spectacle of one spouse going to the Holy Sacrifice, and the the other going to a non-Catholic church on Sunday irritates me especially when I know that the non-Catholic spouse would be a great Catholic. Matrimony is the only Sacrament by which the bride and the groom actually confer the sacrament to each other. All of the sacraments the Holy Spirit confers the gift of the sacrament. Regardless of the faith of the individuals, if the bride or the groom does not believe in the history, tradition, Doctrine, in scripture is God has chosen to reveal it to us then they honestly cannot give that Sacrament or receive it. Why? The bride and the groom but come one in Union with Christ, they become an extension of the Holy Trinity, and they become Ministers of the faith. The children are an extension of this Trinity as well and it stands to reason that the couple should practice their faith and teach their children. If they do this falsely it is the ultimate Abomination because they have denigrated the Sacrament and The Passion of Christ, which is a great insult to God the Father and the mystical Body of Christ- his church. I can understand why this was among the precepts because giving or accepting this Sacrament under false pretenses is surely an abomination. With that said, such an issue is addressed elsewhere in the catechism, since it applies to all sacraments. I have two church-attending adult daughters who tell me that young Catholic men are MIA. One married a wonderful baptist man who goes to mass with her each week and the other has decided to stop dating although her greatest desire is to be a wife and mother. Where are faithful Catholic men? Very often they are at the Traditional Latin Mass parishes. Go to church… Find an active parish and an active Catholic group for your children and family. Several parishes in my state have over 10,000 registered families. They are very vibrant and growing exponentially. We practice the Novo Ordo Mass. Either way, we all come together to sacrifice ourselves with Jesus to our Lord the father on Sundays. The precepts, as declared by the Church, or noted in a particular catechism of a particular era, can change and have. What I found interesting was the “what” and the “when” of this particular revision/removal. The Church has clearly and directly dropped this precept. The Church has the authority to do so. Referring to an earlier catechism with therefore misinform the reader of what is currently required. Cardinal Pell is the result of a mixed marriage and we can thank God for him. It is bad reasoning to allude to an instance where God has redeemed a bad situation, and to argue this shows the situation wasn’t so bad after all. I’m sure Cardinal Pell would have preferred both his parents to have been Catholic. This article is certainly making me think. My wife and I were active non-Catholic Christians when we had our children and brought them up. All four are faithful as adults, the three sons who are married have Christian wives and the two who have children are bringing them up in the faith. I cannot imagine this outcome, or our marriage itself, had we not believed the same as each other. But recently I became Catholic, and that has brought a cross in terms of the unity and fellowship of our marriage. I can imagine how it must be for a mixed Christian marriage in its earlier stages, and how it would hamper the spiritual formation of children. I’m interested to note that this article does not distinguish between kinds of mixed marriage. There must be an ascending scale of potential difficulty, starting with marrying a non-Catholic Christian, then an agnostic, then perhaps a Hindu, then a Muslim, finally an atheist. Maybe those last three in a different order. On a positive personal note, we and all our children are still close, can pray together and encourage each other, for we are all mature adults. One of my married sons (and his wife) preceded me into the Church by a couple of years, so we are quite a mixed family in a wider sense. They’re having so many children, we’re about up to parity in numbers! Refer to the catechism, sections 1601-1666. This article is a bit misleading. The precepts of the Catholic Church are the basic requirements for moral and spiritual health…(see CCC 2041). Since marriage is not a requirement but rather a vocation, it didn’t make sense to keep it there. With that said the basic premise remain within the section of the catechism regarding marriage. Here’s something that a lot of people don’t realize and it may help you understand the reason for this change. First of all, the catechism promulgated by Saint John Paul the second was much more helpful than the Baltimore catechism because it explained a great deal of the doctrine and tradition. Baltimore catechism did not do so well in that area. Secondly, the sacrament of matrimony is the only Sacrament in which the bride and the groom confer the gifs of that sacrament to the other. In all other sacraments, the gift of the sacrament is given by the Holy Spirit. This is pretty huge. As a result, the bride and the groom become one in union with Christ, an extension of the Holy Trinity, and ministers of the Catholic faith. This extends to their children who are also part of that union. Thus the parents are obliged to minister to their children and ensure that they are raised within the Catholic faith. Please understand that it is the concerns of the church to foster healthy spiritual and moral growth as well as to maintain the faith so that individuals will not defect. The church is also a proponent of truth first and foremost.. Regardless of the fate of the Bride or groom, if that individual at the sacrament of matrimony does not agree with the above statements as well as the history, tradition, Doctrine, and scripture, as God has chosen to reveal it to us, then they cannot honestly give or receive that sacrament. As with all sacraments, one must acknowledge and agree with the history, tradition, etc. ….. If someone were to participate in any sacrament without that agreement, it is a denigration of the sacrament itself as well as a denigration of The Passion of Christ. This is likely why the issue of raising children within the Catholic faith was likely a precept. It is a huge offense to God himself to misuse the sacraments. It is the ultimate offense and insult to God as well as to the mystical Body of Christ. So feel free to read through the catechism and if you have specific questions I might be able to help you with them as I have been a Catholic all my life and I am a catechist as well as someone who strives to be a good apologist and faithful Catholic. If one member of the couple cannot agree to these terms then they should not be receiving the sacrament of matrimony nor can they spiritually. The same holds true when we receive the Eucharist. We are not saying amen to just confirm that we are about to receive the body of Christ, we are also saying Amen to mean that we accept cheerfully the tradition, history, Doctrine, and scripture as God has chosen to reveal it to us. Marriage on the other hand is not a requirement, it is a vocation. Not all people are called to marriage. that’s why the information in that sixth precept was moved in the catechism to the section regarding marriage. Nothing has changed in the doctrine. (CCC 1601-1666) also, nothing has changed in canon law. I can understand why this may have been a precept because the sacrament of matrimony is unique. The sacrament of matrimony is the only Sacrament whereby the bride and the groom confirm the gift of that sacrament to each other. With all other sacraments, the gift of that Sacrament is given by the Holy Spirit. So as Catholics we all know that the gift of the sacrament of matrimony is when we become one in union with Christ, we become an extension of the Holy Trinity, and we become Ministers of the faith. It stands to reason that this also extends to our children is we are called to practice our faith as a family and to raise our children as Catholics. Regardless of the faith of the Bride or the groom, if they do not agree with the Doctrine and tradition of matrimony, then they can honestly give or received the gift of the sacrament. This is likely why it was a preset, because if someone does not fully commit to the history, tradition, Doctrine and scripture as God has chosen to reveal it to us, then they commit the ultimate defense against God, and the passion of Christ. Furthermore, it is a denigration of the sacrament!! This is something that people do not necessarily consider, even when we accept the Eucharist as an example. When we say Amen before we receive the Eucharist, we are not just saying that we believe it’s the body of Christ, we are saying also that we agree with the history, tradition, Doctrine, and scripture. if we do not agree honestly, then we are denigrating the sacrament and we should not receive it. This is why divorced individuals do not take the sacrament. They cannot honestly say that they agree with the history, tradition, doctrine, etc…… That’s why we have annulment in the case where one spouse did not fully make that commitment and give the gift of the sacrament of matrimony…..I digress. The precepts of the church are the basic requirements to live a moral life. Please see CCC 2041. Matrimony is not a requirement; it is a vocation. Not everyone is called to marriage and therefore it could not have been a precept- a requirement for everyone. The doctrine and tradition history and scripture regarding marriage has not changed. Please see CCC 1601-1666. Since marriage is the only Sacrament with both the bride and groom confirm the gift of the sacrament to each other, it stands to reason that both individuals must agree to and understand, the history, tradition, Doctrine, and scripture of the Catholic Church. Why? When a couple becomes man and wife they also become one in Union with Christ, and extension of the Holy Spirit, and Ministers of the faith. Their future children are also an extension of this and it stands to reason that they all must practice the faith and the parents must be responsible for teaching their children. If they do not follow this, then they did not follow their commitment when accepting the sacrament. That’s an abomination. That is a direct assault on the mystical Body of Christ an insult to God himself as it denigrates the sacrament making it into something that it’s not. We agree to the same things when we accept the Eucharist at Mass. When we say Amen, we are not only saying that we believe it is the body of Christ, but we are saying that we agree with the doctrine, history, tradition, and scripture as God has chosen to reveal it to us. This is why when someone is not in a state of grace or may have been divorced should not receive the sacrament as they cannot say Amen honestly. These teachings aren’t browbeating by the church, rather it is the church asking parishioners to be honest…… so as not to denigrate the sacrament itself and insult the body of Christ and God the Father..
Mot sure why you keep posting the sane thing and deny the sacramental nature of a,article that adheres to firm but in which the couple may disagree about aspects of The faith? Typing on a small phone with no editing allowed. The weakness in the argument is the use of the very word ‘Catholic’ Catholic used to mean people who shared and professed the same faith but this is not so today. A Protestanty might well be contented with a Catholic who has a ‘modern’ view of the Church for such ‘Catholicism’ is very much leaning to Protestantism. A what is called ‘traditional Catholic’ will on th other hand present problems. The Catholic may want the Rosary said with the children, the Catholic may want Holy Pictures on the wall, the Catholic may insist on the children going to Mass while the other partner stays at home. Yes, and even on morality thee may be differences between the Catholic and the partner. When all were ‘traditional Catholics and there was parish life which catered for families rather than communities the non-catholic knew what was expected of him in marrying a Catholic – today it does not seem to matter. It is true they are at cafeteria Catholics and Catholics who have not been well catechized. That’s one reason I am grateful for the catechism promulgated by Saint Pope John Paul II. With that said, you are missing one thing. The sacrament of matrimony is what it is, regardless of whether or not someone understands it fully. It is not a requirement for a healthy spiritual and moral life. Matrimony is a vocation and not everybody is called to it. That’s why it was removed from the list of precepts. Precepts represent the basic requirements, for living the moral life and growth with God and neighbor. (CCC 2041). 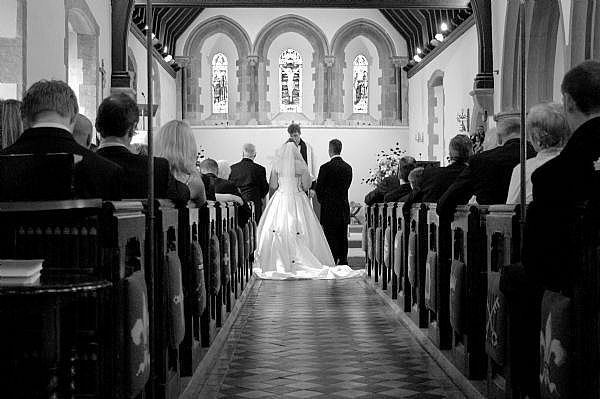 Marriage is the only Sacrament whereby the gift of that Sacrament is given by the bride and the groom. With all other sacraments, the gift of that Sacrament is given by the Holy Spirit. As a result of matrimony, the couple becomes one in union with Christ, and extension of the Holy Trinity, and a minister of the faith. This extends to any children they may have as they are called to live the faith and teach the faith to their children. Whether one is Protestant or not, if both the bride and the groom do not agree to the reality of that sacrament, they cannot honestly receive it or give it. This would be a denigration of the sacrament, and I would guess that this is why it was initially one of the six precepts. With that said, nothing regarding the sacrament has changed nor the doctrine of the church for that matter. There is always a great deal of logic and reason when we see things that look differently. I was a bit upset when I read this article because it brings a sense of doubt among individuals who may not have recently read the catechism. There is so much to learn and so much too easily forget. How do you bring it back? There’s no need to…. The precepts of the church are like the basic minimal standards which a Catholic must follow to achieve moral and spiritual health. Now matrimony is not a requirement. It is a vocation and it is not for everyone. That is why the precept was moved in the catechism. Now, this does not mean that canon law has changed one bit because it hasn’t. If you go to the catechism and look at sections 1601-1666, you will find these requirements and so much more about marriage. Let me tell you why it’s even there in the first place. Most Catholics understand that it is not the holy spirit that gives each spouse the sacrament of matrimony rather it is each individual that confers the sacrament upon the other. That’s pretty huge! So, if a non-catholic is to give this sacrament to his or her spouse, they can’t do so honestly unless they agree to and understand the tradition, and the doctrine of matrimony. When a couple receives the sacrament of matrimony, they become one in union with Jesus Christ, they become an extension of the Trinity, and they become ministers of the faith. Their children also are an extension of the trinity. That’s they are obligated, in union with Christ and as ministers of the faith and an extension of the Holy Trinity to minister to their children and practice the Faith with their children raising them as Catholics. I consider myself a fervent catholic, and I would say I know many catholics who were married at the church with a non-catholic. And often what happens, when the catholic spouse is really devouted and prays for the other, is that the other spouse has a conversion later. It happened to many of my friends! As long as the four vows/pillars of marriage are there, that there’s a true commitment made in chastity and that the other spouse respects the promise of the other spouse to raise children in the Catholic Church, I think it is a legitimate marriage. Cause though marriage is one of the seven sacraments of Redemption, it was already a sacrament in the Creation. Non-believers are able to commit themselves to true love, because it’s written in our hearts as men and women. It’s rare today to find a person who accepts to live chastly and really wish to live all four vows of marriage, even inside the Catholic Church. When you find someone who wants all of that, but doesn’t know Jesus-Christ yet… I would say faith is not far! Everything is sure easier when you share the same faith from the start. But believing in the Catholic Church doesn’t make you necessarily a good spouse. I think this article was a little bit misleading. The precepts are the minimum requirements for a healthy spiritual and moral life in essence. That’s by definition. You can find it in the catechism, 2041. The sacrament of marriage is not a requirement in the same way as the Eucharist. So, all of the teachings and doctrines around what was once a 6th precept is written in the catechism in sections 1601-1666. Matrimony is the only Sacrament whereby each individual confers the sacrament to the other. If a non-catholic spouse to be, does not agree with the teachings and Catholicism, they cannot truthfully extend that sacrament to the other. Furthermore as you know, the sacrament of matrimony brings together two people in union with Christ, an extension of the Holy Trinity, and as ministers of the faith. Thus, it stands to reason that the children as well are an extension of the Holy Trinity and it is the obligation of the married couple to practice their faith with their children and teach them the faith. There are no changes coming to the doctrine of the Catholic Church which has prevailed for 2016 years. Excuse me! For your marriage is NOT the USCCB website…. And there is no change to canon law or the precepts. First and foremost, is the church is concern for the preservation of the faith in marriage. Under the sacrament of marriage, there is a covenant with God by which the couple becomes Ministers of Christ and bonded with Christ. It would make absolutely no sense then with the understanding of what marriage is, to eliminate this precept. Furthermore, they has been no change and will be no change to canon law as referenced in canon law 1125. Lastly, the catechism of the Catholic Church also remains the same where buy marriage is fully discussed from section 1621 through 1666 and more. Apparently, this author does not understand marriage nor does he know how to read the catechism or the USCCB website. This article was upsetting to me because it comes with some false assumptions, is if there were some sinister changes in both tradition and Doctrine…… At least that’s how I read it. When St Pope John Paul II, promulgated the new catechism, there were a number of changes. This article states that the precepts changed and although textually that is true, from a doctrinal standpoint it is not true. By definition, the precepts of the Catholic Church are basically representative of the minimal standards by which a Catholic can achieve moral and spiritual growth. ( See CCC 2041). That is, it is the indispensable minimum in prayer and moral effort for the sake of their growth in love of God and neighbor. Matrimony is not a requirement for spiritual health, it’s a vocation and a very special vocation. Therefore, matrimony is a sacrament it’s not a precept of the church. Furthermore, as a result of this sacrament of matrimony, the couple becomes one in union with Jesus Christ….. AND…. An extension of the Holy Trinity as well as ministers of the faith. The priority from the church’s perspective, when a Catholic chooses to marry a non-catholic, is the preservation of that faith. Therefore, if a non-catholic chooses to engage in matrimony, then they are also choosing and acknowledging matrimony – they are giving the gift of matrimony as defined by the Catholic Doctrine. They cannot extend this gift to their potential spouse honestly if they do not make that commitment to become in union with Jesus and a minister of the faith, especially to their children. The children, are also an extension of that union with Jesus to become ministers of the faith and certainly the extension of the Trinity. So it makes perfect sense to have had this moved from what we would define as precepts, and integrated into the catechesis regarding the sacrament of marriage. Once again, marriage is not a requirement. On another note, the catechism that we have now, again promulgated by Saint Pope John Paul II, is filled with so much more information and explanation, unlike the Baltimore catechism we’re one merely memorized things that they didn’t necessarily understand. I hope the author will publish another article to help Catholics understand the truth. The problem is how to even meet a person who would be a good Catholic spouse. My sons with only one short exception have never found a Catholic girl to date. Almost all the girls were from broken families too. And ALL my young cousins are marrying outside the Church because she has no relevance to them. Also the huge stack of requirements and fees that my son was given when he inquired about marrying in the Church was and is a huge obstacle which his unbaptised fiancée wants nothing to do with. The Church has every right to change the emphasis and precepts as She determines. The Universal Catechism of the Church trumps the Baltimore Catechism (which is merely a out of date regional catechism).